Mariah Perkins works in the field for a GIS lab project. CHESTERTOWN, MD—In today’s economy, few college students graduate with both diplomas and job offers in hand. Thanks to their work with Washington College’s Geographic Information Systems (GIS) lab, seniors Mariah Perkins and Spencer Van Cise will be counting themselves among the fortunate few. They are proof of the effectiveness of the growing work-study program run by the GIS lab, where some 60 undergraduates are now applying their computer mapping skills to a variety of projects for both the College and for outside organizations and agencies. Perkins, an anthropology major from Frederick, Md., and Van Cise, an environmental studies major from Arcadia, Calif., each completed a summer internship with technology consulting firm Booz Allen Hamilton and returned to campus with assurances that a full-time position would await them following their graduation next May. These are jobs with “very generous” starting salaries, adds Stewart Bruce, the director of the GIS program at Washington College who has mentored the two students. Van Cise is continuing to work part-time for Booz Allen Hamilton during the school year, working remotely on a company-supplied computer. He also puts in 10 hours a week in the Washington College GIS lab, honing the skills he’s been building over the last three years. Perkins, on top of her Booz Allen Hamilton internship and job offer, earned a prestigious $5,000 undergraduate scholarship from the U.S. Geospatial Intelligence Foundation. She is studying in Finland for the semester but will likely join Van Cise in working for both the company and the College when returns to Chestertown in the spring. “I’m happy for these students,” says Bruce with obvious pride. “These jobs are really a fantastic opportunity.” He is not surprised that such job offers can come to students at a small liberal arts college without a GIS major. “Companies want critical thinkers who come from a wide range of backgrounds—anthropology, biology, environmental studies, etc.—because they want and need those interdisciplinary teams,” he says. The Washington College GIS program is striking for the number of undergraduates who are using cutting-edge computer mapping technology to complete real-world projects for clients. The 60 student workers, many of them first-years and sophomores, work under professional staff supervision on projects that include mapping crime statistics for the Maryland State Police, creating 3-D cityscapes for town planners and helping conservationists map critical areas and waterways. A recent addition to the project list is helping the Upper Shore Regional Council create an online mapping tool for its Harvest Directory, a listing of the agricultural products and services available in Maryland’s Cecil, Kent and Queen Anne’s Counties. 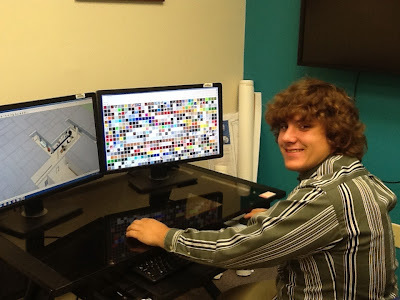 First-year student Steve McFall works part time in the GIS lab. Another GIS student well on his way to gaining that edge is freshman Steve McFall. After attending four of Bruce’s GIS summer programs for young people, he earned a $2,000 scholarship from the U.S. Geospatial Intelligence Foundation his senior year at Smethport Area High School in Smethport, Penn. McFall began working in WC’s GIS lab last summer, before his freshman year began. McFall will be one of a handful of high-achieving students joining Bruce and his Washington College contingent this October at the Geospatial Intelligence Symposium in Orlando, Fla. The symposium draws GIS leaders from business, military and public service sectors and offers the students a chance to network and explore career opportunities. For Bruce and the GIS program he has built at Washington College, such trips are one more way to help students map their own futures. Thanks for your grateful informations, this blogs will be really help for students scholarship . NICE BLOG!!! Education is the process of bringing desirable change into the behavior of human beings. It can also be defined as the “Process of imparting or acquiring knowledge or habits through instruction or study”. Thanks for sharing a nice information. Improvising one's knowledge is the biggest thing can be done in a life time. So as you have said above the best curriculum at the right time would make a lot changes to our life. Thank you very much for sharing this. I feel so grateful to you.